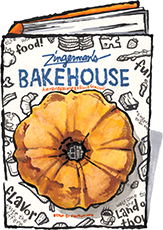 Zingerman's Bakehouse Cookbook for sale. Buy online at Zingerman's Mail Order. Gourmet Gifts. Food Gifts. Since 1992, Zingerman’s Bakehouse has fed fans in Ann Arbor and across the country with traditional breads, brownies, cookies, coffee cakes, and other baked goods, the likes of which have been disappearing from our shops and our home baking repertoires. Now to mark the occasion of our Bakehouse's 25th anniversary we have 65 of our most popular recipes in a handsome cookbook with a ton of pictures and, being Zingerman's, illustrations. Featuring behind-the-scenes stories of the Bakehouse that share our growing pains, lessons learned and professional techniques that enable and encourage every home baker to bake deliciously. Bonus! Get the book with a nosher-sized Sour Cream Coffee Cake, large enough to serve 5-7 people generously. Then read about how to make the coffeecake in the book! "The book offers all these classic recipes and an eclectic assortment of others that reflect the wide-ranging interests of the bakers who have passed through the community over the years... [The book] guide[s] with a gentle and humorous hand, perfect for those who long to know everything about baking — as well as those who thought they already did." "The book does have some mouthwatering images, but its real appeal lies in the no-nonsense recipes that seem like they're just an oven-preheat away from appearing warm and fresh in your kitchen." "Anybody who has ever ordered... from the website of Ann Arbor's legendary Zingerman's has also probably thrown in one of the deli's Black Magic Brownies or Ginger Jump-Up Cookies. For those recipes alone, this is a crucial addition to any baker's bookshelf. Perhaps less expected (but just as worthy) are the recipes for Detroit-style pizza, vanilla-glazed crullers, spice-packed New Deli (see what they did there?) coffee cake, and the solid business advice (yes, business advice) that fills the rest of these pages." "This is the must-have baking book for bakers of all skill levels."